CLAUDIO RECCHI ON UKA UKA WINS LERICI EDITION OF THE EUROPEAN MELGES 32 AUDI SAILING SERIES AND CLAIMS OVERALL SEASON TITLE. 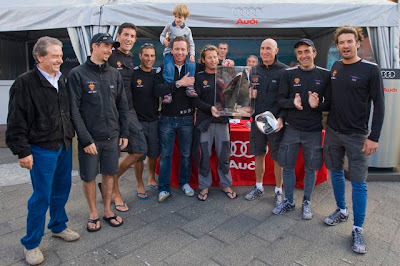 Claudio Recchi and his talented crew aboard Lorenzo Santini’s Uka Uka, rounded off a superb season in the European Melges 32 2008 Audi Sailing Series by winning the final regatta in Lerici, Italy and claiming the overall 2008 Audi Sailing Series crown. Recchi, a past Mumm 30 World Championship winner, was delighted with his double victory and paid tribute to the skills of all his crew including tactician Gabrielle Benussi and Melges Europe chief Federico Michetti .